I’ve had this book since sometime in the late 1970s, when I was learning to play more intricate finger-picking guitar songs. I don’t remember where I found it – at that time I was living in Flagstaff, so it could have been there. I didn’t read music, but this book is all in standard notation, so it gave me the incentive to learn how to read. Now I find it much easier than tablature, which I think is the scourge of all guitarists everywhere and should be banned by law. Back then, the first one I learned was Judy – I still play it occasionally. I also took on “A Day at the Seaside”, “Debbie Anne”, and “Ladye Nothynges Toye Puffe”. A lot of them are in the English Renaissance style he is known for, but there are a couple of the folkie ones. Anyway…I have never seen this book anywhere else and it is certainly out of print now. Early on, I made a copy and bound it and used that for my main book. Recently, I figured I should find the original again in my stuff and scan it. If you want the hard copy, real book, there are a couple available on Amazon…used, of course. My book has the binding apart, which makes it easier to scan page by page. 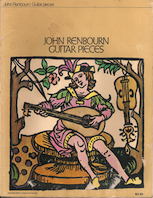 John Renbourn – Guitar Pieces (25M PDF).